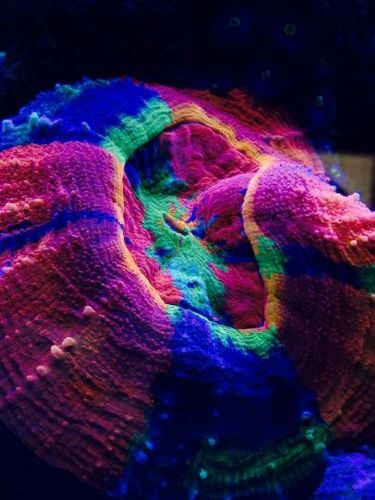 We are selling our tank ready to go now. 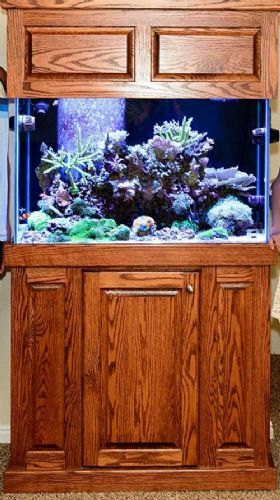 It's a standard 65 gallon with oak stand and canopy. It runs a dual pipe herbie overflow with return plumbed over the back into a seaswirl return (included). Can go right up against the wall within 1 inch. 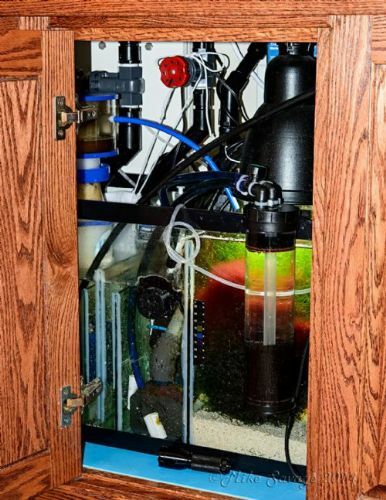 It has a custom 10 gal sump custom elite aquatics ATO water container in stand and is all plumbed including 3 gate valves on both drains and return to control everything. Will include return pump and back up return pump. Really no scratches. Runs dead quite no gurgles or splashing. We are keeping our lights, skimmer,ATO and vortechs for our next tank. It is currently up and running for anyone to come see. Happy to include sand but if it were me I would change it. I have tons of stuff I can include for this tank from reactors, pumps, skimmer stands, etc. This is a quality setup, solid wood. You don't see many stands like this around. And Bryce is a local legend, if you don't know! Bump. Very surprised this hasnt sold. Tank is 100% movable as all pipes and plumping has pvc unions..nothing is glued or hard plumbed. My wife and I have moved this tank before. It is currently up and running for anyone to come see. Happy to include sand and live rock but I would change sand if it were me. 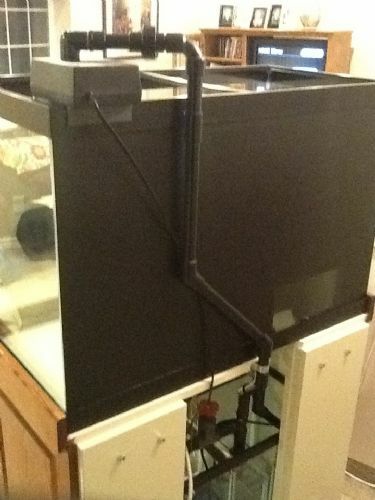 I have tons of stuff I can include for this tank in the purchase price from reactors, pumps, skimmer stands, magnets, refugium light and spare bulbs, quarantine tank set ups, basically the contents of my "fish" room, etc. Someone come get this tank before we take it down and just take it with us. We sold our tank on Saturday to 10isbum Scott. Thank you everyone.